Here we demonstrate how we can use RGT-Viz for drawing a lineplots. 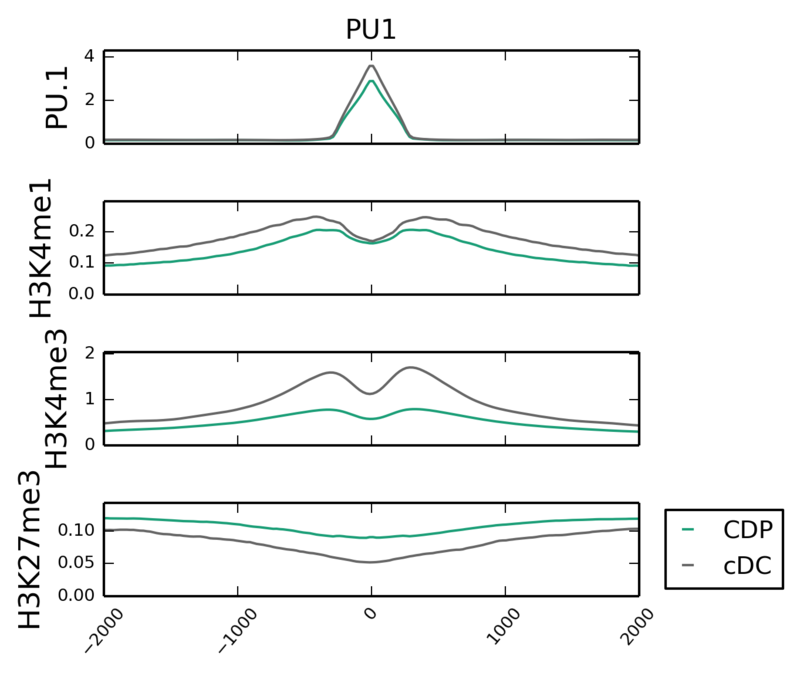 This allows for example to inspect the ChIP-Seq signals around particular genomic regions, as PU.1. peaks. Before you proceed, please install RGT-Viz. We will use the epigenetic data from dendritic cell development study  as example. There, we have ChIP-Seq data from the transcription factor PU.1. and histone modifications H3K4me3, H3K4me1 and H3K27me3 on four cellular states: multipotent progenitors (MPP), dendritic cell progenitors (CDP), common dendritic cells (cDC) and plamatocyte dendritic cells (pDC). 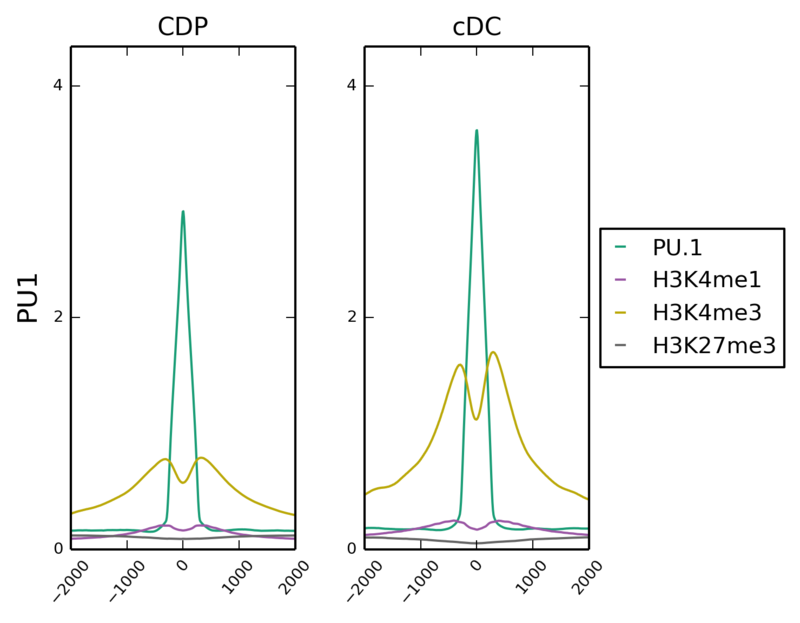 For simplicity, here we only look at data from the differentiation transition CDP to cDC. Please follow the following steps to download the necessary example files: genomic signals in bigwig (bw) format for histone modifications and PU.1, as well as peaks from PU.1 (bed files). Download the folder “example_RGT-Viz” from here. These files include the genomic signals of histone modifications (files with a .bw ending) and the genomic regions of PU.1 peaks (files with .bed endings). Before we use the RGT-Viz, you must define an experimental matrix. This tab separated file includes information necessary for RGT to understand your data, i.e. file paths, protein measured in the ChIP-Seq experiment, type of file and so on. For example “Matrix_CDP.txt” includes the files, which we need for finding the association of genomic signals on the genomic peaks of PU.1 transcription factor. The first column (name) is a unique name for labeling the data; the second column indicate the type of experiment. Here we have either “regions” (genomic regions in bed format) or “reads” (genomic signals in bigwig or bam format). The third column is the file path to the data. You can include additional columns to annotate your data. In our example, the 4th column (factor) indicates the protein measured by the ChIP-Seq and the 5th collumn indicates the cell, where experiments were performed. You can add any more columns and the column names identify the feature. -t defines the title of this experiment. This command will generate a directory “results” with figures and html pages. This lineplot shows the genomic signals of different histone modifications on the PU.1 genomic regions. The histone modifications are shown in different colors, and the window is centered by the midpoint of each genomic regions from PU.1 peaks. Lineplot is designed to compare more categories of data. Here we show another example to include one more cell type, cDC. -sx shares the y-axis for the plots in the same row. 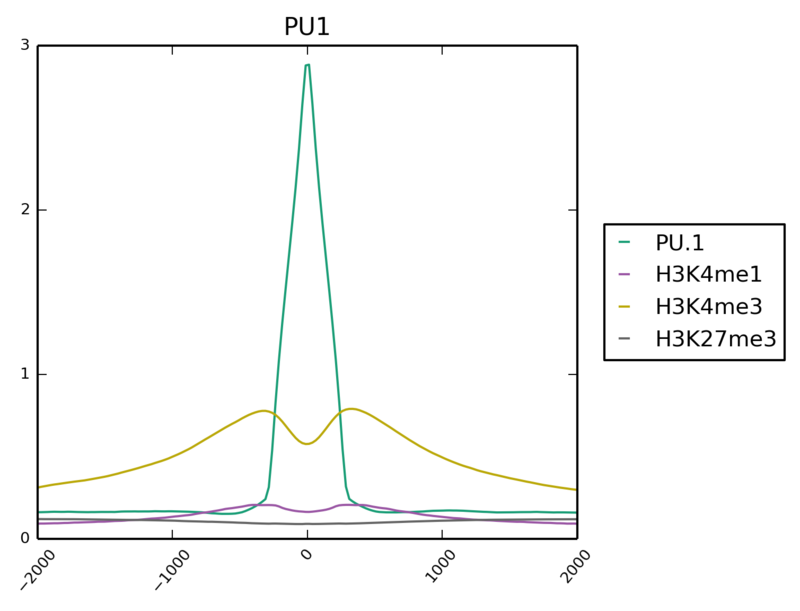 This lineplot shows the difference of histone signatures on the PU.1 peaks among two cells. This plot indicates an increase in PU.1 and H3K4me3 levels on cDC cells compared to CDP cells. -col defines the way to group data in columns, here we use “regions”. This design offer better comparison between cells by separating different histone modification and show cells in different colors. Therefore, by changing the experimental matrix or the way to present, you can generate more complicated lineplot for comparison of your data across cell types, treatments, histone modification, or any other designs. RGT-Viz allows several other plots variants. Lin Q*, Chauvistre H*, Costa IG*, Mitzka S, Gusmao EG, Haenzelmann S, Baying B, Hennuy B, Smeets H, Hoffmann K, Benes V, Sere K, Zenke M, Epigenetic and Transcriptional Architecture of Dendritic Cell Development, Nucleic Acids Research, 43:9680-9693, [paper][data][genome tracks].